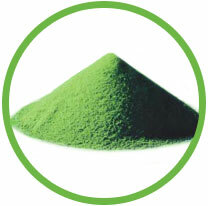 Green foods are often rich in enzymes. Enzymes are important for digestion, for a healthy immune system, and can also aid detoxification. Like many other nutrients, enzymes can be destroyed by heat or acidity. Green Magma is produced with the minimum of processing in order to preserve the potency and activity of these enzymes - and to ensure their usefulness to your body. Green Barley contains more than 20 enzymes including Super Oxide Dismutase often abbreviated as S.O.D. - a powerful free radical scavenger. Other important enzymes found in Green Barley Grass include cytochrome oxidase, peroxidase, catalase, fatty acid oxidase, and transhydrogenase - some of which may play a role in neutralizing pesticides and chemical additives in the body.